With the Mid-American Conference East Division out of its control, Ohio is only focused on beating Buffalo. After Akron’s win on Tuesday night, the chance for Ohio to head to the MAC Championship Game was erased. Now, Friday’s game will be a game for pride, not a championship. 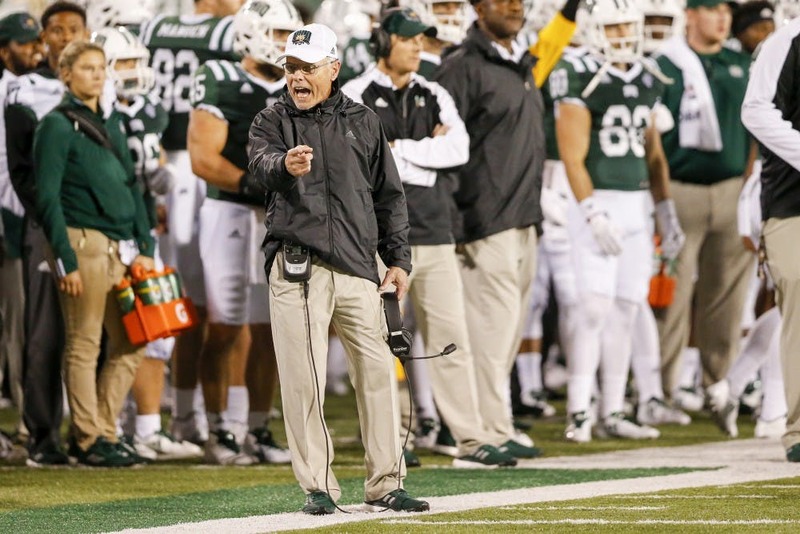 Coach Frank Solich spoke on how the Bobcats have moved on from losing against the Zips in his Monday press conference. The Bobcats will play the Bulls on the road Friday, and it’ll be their last game of the regular season. Regardless of the outcome in Akron on Tuesday, Ohio knows it can control what happens in Buffalo. “You can only jump up and down and pat yourself on the back so long, and you can only beat yourself up so long,” Solich said. Solich and the Bobcats aren’t dwelling on the loss. But as Solich fielded questions about the Akron game, he mentioned what hurt Ohio perhaps the most: turnovers. The Bobcats had three turnovers against the Zips. Nathan Rourke threw two interceptions, and running back David Burroughs fumbled on a kickoff return during the second quarter. Ohio has tied an opponent in the turnover battle once, and that was when it defeated Kansas — each team had one turnover. Other than that, the Bobcats are undefeated when they win the turnover battle. But they’re 2-3 when they lose it. “Three turnovers to zero is asking a bit much to overcome when you’re playing a good football team,” Solich said referring to the Akron game. Despite the Bobcats losing the turnover battle against the Zips, they had chances to win the game. As Ohio prepares to play the Bulls, a team ranked No. 6 in the MAC for turnover margin (-1), it’ll need to keep possession of the ball. Those efforts to keep possession will need to be seen in the passing game, an area the Bobcats must show that they can perform well in considering they’re a run-first team. “We didn’t really adjust well and didn’t have a good passing game in that game (against Akron),” Solich said. Rourke passed for 110 yards and threw two interceptions against the Zips. After the loss against the Zips, Rourke said he’ll need to improve his passing game. He knows he can’t just be a runner. Aside from the Bobcats trying to improve in their passing attack, improving their pass defense will be a point of emphasis as well. The Bulls lead the MAC in passing yards per game (290.5). And with the Bobcats’ quality run defense, the Bulls will probably throw more than they’ll run. As the Bobcats prepare for one of the best passing attacks in the MAC, the pass defense will need to produce alongside the run defense. But at the same time, the Bobcats will need a quality passing attack of their own.